The dominant model for training in higher education today is the Modular System where students, under supervision, select a series of short courses or modules from a wide range of choices available to them. The system ensures a breadth of study and enables the student to pursue a personal line of interest. In this system flexibility and breadth of study are the prime concerns. The BA in Performance Arts at Middlesex University is an excellent example of this kind of course. The BAPA is an interdisciplinary course involving a comparative study of dance, drama and music. Here students follow a core course of aesthetics and criticism plus their main study of either Dance, Drama or Music plus a choice from a vast range of supporting studies from all three subjects and including six modules dealing specifically with physical theatre topics. Each intake produces its own Physical Theatre specialists. Without BAPA it is unlikely that a company such as Trestle would have evolved. 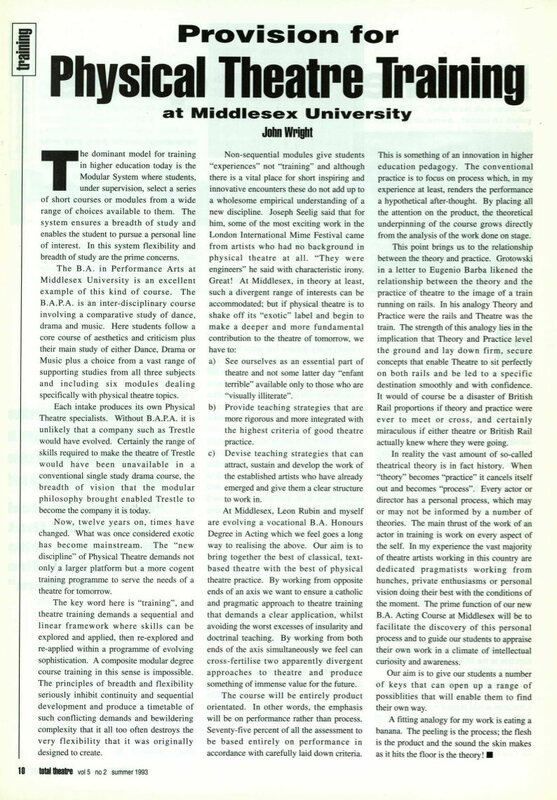 Certainly the range of skills required to make the theatre of Trestle would have been unavailable in a conventional single study drama course, the breadth of vision that the modular philosophy brought enabled Trestle to become the company it is today. Now, twelve years on, times have changed. What was once considered exotic has become mainstream. The ‘new discipline’ of Physical Theatre demands not only a larger platform but a more cogent training programme to serve the needs of a theatre for tomorrow. The key word here is ‘training’, and theatre training demands a sequential and linear framework where skills can be explored and applied, then re-explored and re-applied within a programme of evolving sophistication. A composite modular degree course training in this sense is impossible. The principles of breadth and flexibility seriously inhibit continuity and sequential development and produce a timetable of such conflicting demands and bewildering complexity that it all too often destroys the very flexibility that it was originally designed to create. a) See ourselves as an essential part of theatre and not some latter day ‘enfant terrible’ available only to those who are ‘visually illiterate’. b) Provide teaching strategies that are more rigorous and more integrated with the highest criteria of good theatre practice. c) Devise teaching strategies that can attract, sustain and develop the work of the established artists who have already emerged and give them a clear structure to work in. At Middlesex, Leon Rubin and myself are evolving a vocational BA Honours Degree in Acting which we feel goes a long way to realising the above. Our aim is to bring together the best of classical, text-based theatre with the best of physical theatre practice. By working from opposite ends of an axis we want to ensure a catholic and pragmatic approach to theatre training that demands a clear application, whilst avoiding the worst excesses of insularity and doctrinal teaching. By working from both ends of the axis simultaneously we feel we can cross-fertilise two apparently divergent approaches to theatre and produce something of immense value for the future. The course will be entirely product orientated. In other words, the emphasis will be on performance rather than process. Seventy-five percent of all the assessment is to be based entirely on performance in accordance with carefully laid down criteria. This is something of an innovation in higher education pedagogy. The conventional practice is to focus on process which, in my experience at least, renders the performance a hypothetical after-thought. By placing all the attention on the product, the theoretical underpinning of the course grows directly from the analysis of the work done on stage. This point brings us to the relationship between the theory and practice. Grotowski in a letter to Eugenio Barba likened the relationship between the theory and the practice of theatre to the image of a train running on rails. In his analogy Theory and Practice were the rails and Theatre was the train. The strength of this analogy lies in the implication that Theory and Practice level the ground and lay down firm, secure concepts that enable Theatre to sit perfectly on both rails and be led to a specific destination smoothly and with confidence. It would of course be a disaster of British Rail proportions if theory and practice were ever to meet or cross, and certainly miraculous if either theatre or British Rail actually knew where they were going. In reality the vast amount of so-called theatrical theory is in fact history. When ‘theory’ becomes ‘practice’ it cancels itself out and becomes ‘process’. Every actor or director has a personal process, which may or may not be informed by a number of theories. The main thrust of the work of an actor in training is work on every aspect of the self. In my experience the vast majority of theatre artists working in this country are dedicated pragmatists working from hunches, private enthusiasms or personal vision doing their best with the conditions of the moment. The prime function of our new BA Acting Course at Middlesex will be to facilitate the discovery of this personal process and to guide our students to appraise their own work in a climate of intellectual curiosity and awareness. Our aim is to give our students a number of keys that can open up a range of possibilities that will enable them to find their own way. A fitting analogy for my work is eating a banana. The peeling is the process, the flesh is the product, and the sound the skin makes as it hits the floor is the theory!